OneNote is one of our favourite note taking tools. It provides a collection of powerful features that enable you to easily record, edit, and share your notes. ‘You can type, scribble, handwrite, or draw your notes as if using a pen and paper. With a single click you can convert your handwritten notes into typed text.’ Check out this post to learn more about what you can do with OneNote. In today’s post we are drawing your attention to this excellent Chrome extension to consider using with your OneNote. 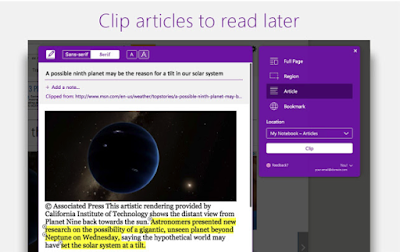 OneNote Web Clipper lets you clip digital content from the web right to your OneNote account. It is similar to Evernote Web Clipper but offers way better features. You can use it to clip videos, PDFs, pictures, or a visual bookmark of a page. Everything you clip is saved to your OneNote account where you can access, edit and share it with others. You can also access your clipped content from different devices even if you are not online. Other features provided by OneNote Web Clipper include: 'no clutter, articles, recipes, or products can be clipped without all the ads, navigation, and noise; highlight text, adjust the fonts, or add a note before you clip; clip the whole page or several selections on the page and many more'. Give it a try and share with us your feedback in our Facebook page.